Romantic ruins and peaceful parkland - Once the greatest and richest Abbey in England and now an awe-inspiring ruin set in some 36 acres of parkland, ponds, orchards and wildlife areas. 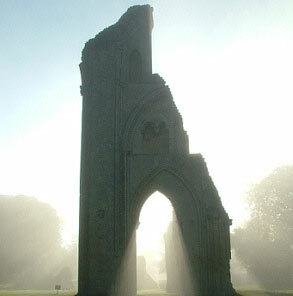 Visit Glastonbury Abbey and you will not fail to be moved by its tragic history. The legendary burial place of King Arthur - It was here in 1191 that King Arthur and his Queen Guinevere were discovered by the monks. History Revealed! Hear tales of the past from our costumed guides - From March to October hear tales of Abbey life, the monks that were here and even of King Arthur’s court! 2000 years of Christian History and Mystery - Traditionally the earliest Christian sanctuary in Britain. Did Joseph of Arimathea bring Jesus here? Sense the prayerfulness where people have worshipped for 2000 years. Why not enjoy a light lunch, refreshment or cream tea in our outdoor summer cafe (open early May until late September),or browse around our excellent gift shop for a souvenir. Glastonbury Abbey, founded in the seventh century, was a rich and powerful monastery in Glastonbury, Somerset, England. The ruins and associated buildings are open today as a visitor attraction.